On Sale £ 29.97 - all incl (No hidden extras). But do you really need the fuss of Reverse Osmosis? We probably won't sell the original cartridges but we might be able to supply you with high quality, compatible cartridges. Firstly almost all reverse osmosis water filters on the market are basically the same. Anyone can buy a generic reverse osmosis unit from a factory in China and stick on a glossy looking label with their "brand name". Unfortunately many people who do this and then sell the filter to unsuspecting customers at a vastly over inflated price of £400 plus, often tend not to worry too much about the simple matter of supplying the required replacement filters. The problem is that you usually need to change your cartridges every 6 months to ensure your water filter operates properly. The good news is that most water filter cartridges are basically plastic tubes filled with carbon. Changing one make of cartridge for another is not unlike changing one light bulb for another. They all do the same job. It is simply a question of getting the size right. 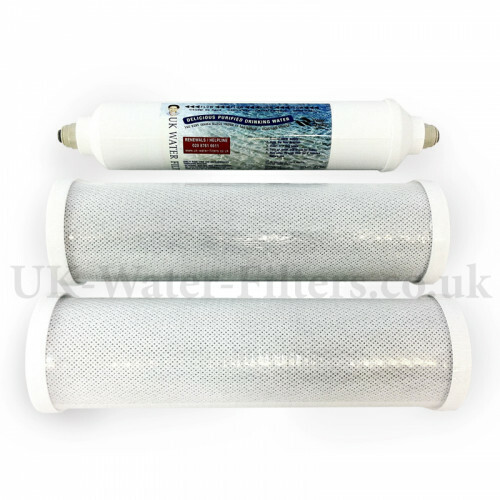 Our reverse osmosis replacement kits comprises 2 high quality 10 inch 5 micron type carbon block pre filters plus a post filter. 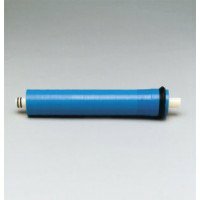 One of the original filters you probably have is a lower quality sediment type filter. Please rest assured that our better one does the same job but much more effectively. More than 2 housing chambers? If you have three or more "lower housing chambers" under your main RO unit then you can leave the surplus ones empty. It is simply not necessary to have them all occupied. Our 2 high quality ones will suffice. (It seems that some RO manufacturers simply fit more than 2 housings in order to increase their renewal income). Their diameter is approx 66mm. Like all water filters, you will need to replace the filters on the system periodically to ensure maximum performance. 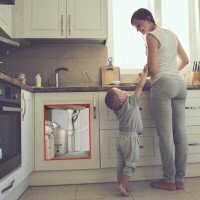 You need to change the three filters every 6 months. We send you a reminder. Every 3 years or so you will need to change the membrane. You will know when to do this by the change in the taste of the water. If you need to change your membrane the best thing to do is to remove it from its housing, take a photo of it with your mobile phone and email it to us. We will be able to see if we can replace it. Do you really need a reverse osmosis water filter? While these give you very high quality water filtration, perhaps you only wanted your tap water filtered so it tastes good? British tap water is among the best in the world. The problem with it is that it contains chlorine and other treatment chemicals which affect the taste and odour. This leads many people to buy overpriced and environmentally damaging bottled water. However, you can get very nice tasting water from your mains water supply by using a simple but high quality single chamber water filter. This is what most of us here at UK Water Filters Ltd use in our own office and homes. We would normally only recommend reverse osmosis to someone presenting a medical problem like an allergy where they need to get rid of a particular chemical in their local water supply. This type of filter is very simple to fit. You keep your existing water connection and tap. All you do basically is take the in and out water tubes from your reverse osmosis system and push them into the new simpler but highly effective water filter. The cartridges have a 1 inch hole at either end, in the middle, to slot into the housing unit. If you didn't get your Reverse Osmosis system from us it's quite possible our cartridges will fit and do the required job. You simply need to measure the filters that are in the lower housing chambers and make sure they are the same dimensions as ours. We have had several products over the years and have found the products have solved our long standing water issues. Good reliable and great value service. Thanks Guys. Very happy with the service, the results, as well as the regular, timely, reminders. Nice people to do business with!